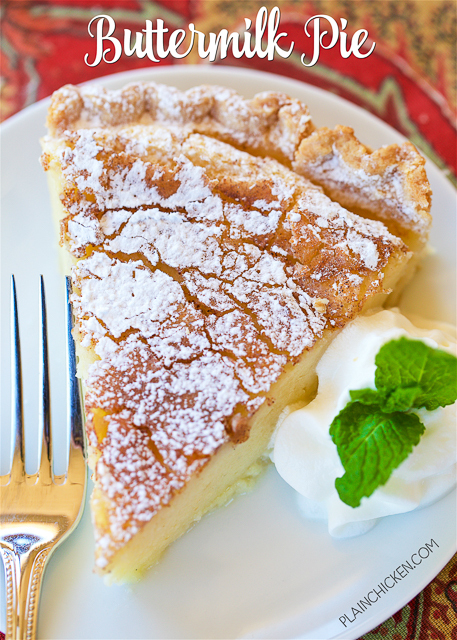 Buttermilk Pie - so simple, yet so AMAZING! Perfect ending to your holiday meal! Can make ahead of time and refrigerate until ready to serve. Eggs, sugar, flour, buttermilk, vanilla, butter, cinnamon-sugar. This pie is SO good! It is always the first thing to go! Pies are my go to holiday meal desserts. They are easy to make and feel a lot of people. I like to make at least three different pies for Thanksgiving and Christmas dinner. This year I am adding a new pie to the menu - Buttermilk Pie. I always have buttermilk on hand during the holidays to make cornbread. 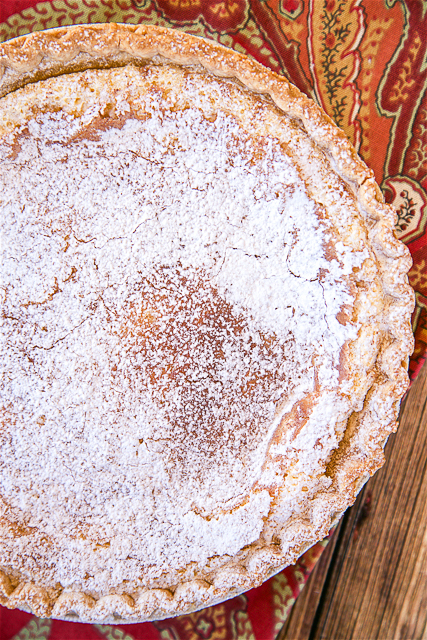 This Buttermilk Pie is a great way to use up any leftover buttermilk you might have!! This was my first time having a Buttermilk Pie, and I was blown away! This was SO good!! I sprinkled the top with cinnamon sugar before it baked and that really put the pie over the top. You definitely want to make this pie the day before serving. It tastes better once it has been in the refrigerator for a few hours. We sprinkled some powdered sugar on top of the pie and served it with a dollop of whipped cream. Perfect!! Whisk together eggs, 1 cup sugar, flour, buttermilk, vanilla and butter. Pour into pie crust. Combine 2 Tbsp sugar and cinnamon. Sprinkle on top of pie. Bake for 35 to 40 minutes. Remove from oven and cool completely. Sprinkle with powdered sugar, if desired. Refrigerate until ready to serve. This is a beautiful pie! Do you think I could use cornstarch instead of flour? Thank you. Yum! I will be making this for Christmas! Love buttermilk pie! This recipe makes me think of my Grandma Lois; she made them all the time. Would love to make this! Just curious tho' is there a difference in which type of buttermilk to use. I recall seeing a difference in other recipes using buttermilk or doesn't it matter?